In 1979 while living in France (Chinon) I happened to become acquainted with an acupuncturist who introduced me to the research of Dr. Paul Nogier. Nogier experimented using pulsed light on the iris while noting fluctuations in the Autonomic Nerve Wreath, and incorporated this information into a diagnostic system, (Treatise on Iridodiagnosis” 1975). These events would later prove to be the foundational seeds for the development and patenting of the “Photon Stimulator”. With the development of the Photon Stimulator, I became more interested in applying the pulsed and colored light to acupuncture points and marketing the device as such (I had also married Anna, an acupuncturist). This journey has required that I become intensely knowledgeable of the physics of light and color (standard and alternative), and has kept me abreast of a variety of paradigms, and clinical applications throughout the world. From the mid 1970’s on, I had a peripheral interest in iridology (the study of the structures, shapes and colors of the iris as reflexly related to organs and systems in the body) and studied the works of Dr. Bernard Jensen, a chiropractor and naturopath here in the United States. My interest was sparked in 1994 by information from a variety of European countries which differed from what has become known as “American Iridology”. At that time I trained and became certified with the International Iridology Research Association which embodied the European approaches to the iris. Iridology is a valuable tool for understanding genetic predispositions. It is used in some hospitals in Germany and Russia, is taught at the Paris Medical School, and practiced by medical doctors throughout Europe, Cuba, Korea, Asian, Indonesian and South American countries. It has not been readily accepted by the medical community in this country because of some basic misconceptions of American Iridology. European medical doctors have had the advantage of using autopsies, hospital research studies, surgeries, etc. to validate or discredit prior beliefs about what the signs in the iris actually indicate. One of the tenets of American Iridology is that the iris indicates physiological conditions which are actually present at the time. This is based on an underlying belief that the iris changes in structure, and can show signs of improvement along with corresponding improvement in the organs or systems. Viewing of hundreds of thousands of iris images has shown that this is not the case. The iris essentially stays the same from the time of initial development. Most sign or color changes are generally subtractive – the results of nerve damage, or degeneration. But once these are registered in the iris, they hardly ever disappear. Notwithstanding the rare exceptions to the rule. If we are on a “cleansing fast” or juice fast, the protein particles decrease in size and thus reflect light differently. This shows up in the iris as a lightening and brightening of the eye. American iridologists also believed that many of the colorations in the iris were a direct result of toxins. This has also been proven false. Many colorations do indicate a variety of chemicals in the body as a direct result of organ malfunctions, but not as a result of ingested toxins, chemicals, or drugs. When media talk shows juxtapose medical doctors with American trained iridologists the results are usually disheartening for the field of iridology. The iridologist will attempt to point to specific weaknesses believing they are current, whereas the medical diagnosis is often quite different. This is because the iris shows genetic predispositions and not what is appearing as a current acute issue. However most people do fall into the path of living-out specific organ and system weaknesses. It is improper to assert that we can use the iris as a tool for accurate diagnosis. Iridology is about understanding our own physiological predispositions, and taking responsibility for our own longevity as best we can. I feel that many iridologists do, in fact, accurately draw conclusions about a client’s current health conditions, but it may be more as a result of looking deeply into a person’s eyes and intuiting their energy field, than from the actual signs themselves. Genetic predispositions indicate organs and systems where resistance is lower. They have a lowered ability to react to stresses. The eye is an extension of the brain. It is also the only transparent window we have on the body which allows us to look into an internal structure. The information in the iris becomes apparent via chemical, vascular, nervous system, and energetic influences. Iridologists look at the structure of the vessels (trabeculae), spots (psora), overall coloration, rings, ridges, clouds, nerve wreath variations, the pupillary border, etc. Although iridology cannot be used to diagnose, it is an incredibly important tool for understanding an individual’s basic constitution, and weaknesses. Individuals who are equipped with this information have specific knowledge which dictates their own preventative health care system. Research at the University of Cambridge, UK, by John Daugman and Cathryn Downing, using an algorithm that converts the intricate pattern of furrows and ridges in the iris into a 20,000 – bit barcode, concludes that getting a matching code by comparing two images is as low as 1 in 7 billion. (Nature, August 2001). Even genetically identical twins have iris barcodes as different as unrelated eyes. This information assists parents in understanding their children, and can be used for mutual life enhancement by marital partners. Employers and organizations have also used this as a valuable tool in personnel searches and for employee resource management since the iris also shows psychological predispositions.. Since then the question has persisted. More recently, another French physician from Lyons, Dr. Pierre Fragnay, has conducted some research using full spectrum, pulsed and colored light which is emitted via optic fiber. He discusses the techniques he has developed in his book “La Chromotherapie Irienne” (Corona Books, UK, 2000). He applies the light about 1/2″ from areas of the iris while at the same time keeping his thumb on the radial pulse, noting changes in the VAS. He treats areas that have a VAS response. These responses are indications that the body is self regulating. He notes cases which have had significant improvement after only one or two treatments. Dr Vincenzo Di Spazio, professor of iridology at the University of Urbino, Italy, found that the pupil sphincter muscle (parasympathetically controlled) and the pupillary dilator muscle (sympathetically controlled) are subject to iridial photostimulation. Photostimulation of the sympathetic long muscle of the pupillary dilator “tends to produce tachycardia, mild dyspnoea, paraesthesia of the fingertips, sensations of heat, and increased anxiety.” photoexcitation of the pupillary sphincter “induces muscular relaxation of the trapezius, a decrease in anxiety, and drowsiness.” (p12, Advanced Iridology Research Journal, Vol. 2 , Nov 2000). Dr. Josef Markarchuk, a medical doctor and researcher at the University of Moscow has found that “Chromo-Iridology can be applied with positive results on pathologies of chronic pain, stomach, duodenum, prostate gland, neuritis and pancreas. The subject is in continuous evolution. Further research is ongoing and essential. Chromo-Iridology has found success in Russia with 75 to 80% of cases treated”. (p41, Advanced Iridology Research Journal, Vol. 1, March 2000). Types of Light: The eye is an incredibly sensitive organ, and although lasers may be used for surgery, even low level lasers are damaging to the retina. Lasers make light coherent – that is they make the light particles travel in one direction. If they were not harmful they would be ideal for pinpointing specific areas of the iris for photostimulation. However, the safest route is to use incoherent light. Unfortunately, it travels equally in all directions and makes pinpoint accuracy more difficult. Small diameter fiber optic cable allows us the ability to comfortably approach the iris without being burdened by cumbersome equipment, while providing a microlight source. The Photon Stimulator (patented 1998) was designed specifically for this purpose. It uses a xenon full spectrum light which travels through six feet of light guide to a handpiece, making it convenient to shine light on areas of the iris approximately 2.8mm in diameter, depending on how close to the iris it is placed. Xenon gas, is the best choice as a light source because it is as close to the sun’s output as we can obtain at this time. There is a lot to be said for using a light source which is closest to what the body has evolved with. Xenon also has many regenerative qualities and associations with zero point energy that are beyond the discussion of this article. Xenon light is safe, color balanced and full spectrum. Pulse Rates: It seems that most researchers prefer to use pulsed light rather than continuous light, and for good reason. Nogier discovered specific pulse rates beneficial to embryological tissue; mesoderm, ectoderm, and endoderm. When his specific pulse rates were used for problems in a particular area, tissue regeneration and healing occurred at an increased rate. But if we look at the most dominant frequencies affecting the body, we find 7- 10 Hz as the most physiologically reinforcing. Many other researchers have found very dominant overriding pulsed fields in which we evolved and continue to exist. James L. Oschman, a biological researcher, describes in his book Energy Medicine: the Scientific Basis, how since the 1970’s the emissions from the hands of healers averages 7-10 Hz. Also, brain wave activity averaged about 7.8-8 cycles per second. The brain waves also became synchronized with the earth’s geoelectric micropulsations – the Schumann Resonance (caused by a wave effect of lightening striking the earth on an average of 200 times per second, between the earth and the outer ionosphere). Oschman describes that “…this entrainment may enhance the evolutionarily ancient communication and regulatory systems involved in healing.” In one experiment at the Max Planck Institute in Germany (1968) it was found that a very weak 10 Hz field is the only field that dramatically restored normal patterns to subjects, which had been shielded from natural external rhythms for an extended period of time. 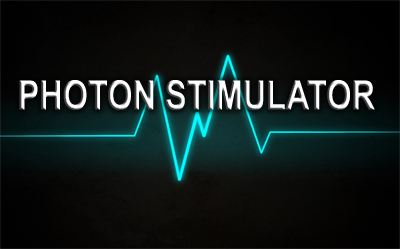 The Photon Stimulator was designed to give an adjustable pulse rate in the biologically optimal range of 2- 10 Hz. This range has been proven to not only be safe, but biologically reinforcing. How Can the Iris be a Photoreceptor? William Tiller,Ph.D., a Stanford researcher, writes in his book, Science and Human Transformation,(Pavior, 1997), “Human photoreceptors, the flavin molecules, are not limited to the retina of the eye but are ubiquitous, being found in virtually every tissue of the body. In addition, flavins are not the only photoactive molecules in the body: carotenes, melanin and heme molecules, such as hemoglobin and bilirubin, plus a great variety of metalloenzymes are also photoactive. Thus the key difference between chlorophyll and hemoglobin, where iron in hemoglobin replaces magnesium in the molecular hub of chlorophyll, begins to take on special significance.”(p134). Thus the iris as a photoreceptor becomes quite easy to consider. In an article by James L. Oschman, Ph.D., Exploring The Biology of Phototherapy, (April, 2001, Journal of Optometric Phototherapy), he talks about another pathway that the body becomes aware of photons, in addition to the rhodopsin reactions initiated by photons at the rod ends. This pathway conducts information much faster than nerves and connects to the connective tissue in which the cells are embedded. Cilia and flagella enable single-celled organisms to sense their environments. Jelle Atema from the Woods Hole Oceanographic Institution published a paper suggesting that sensory systems may be movement systems working in reverse. “The same molecular mechanisms that convey sensory information into cells can also produce movements, and vice versa.” (p4). The sensory cilium in the retina and in all of nature may act as motile structures but in reverse, “…responding to stimuli by initiating structural changes that are propagated through the cytoskeleton and thence through the entire living matrix.” (p4) Atema proposed that the microtubules and the entire living matrix are active components in the reception and transmission and processing of sensory information. The sensory information (photon information) is transferred from the cilia and flagella endings to the core of microtubules, through the cytoskeleton of cells and into neighboring cells and the system of connective tissue. Light is able to be transferred across the entire living matrix and is capable of being conducted at an incredibly fast rate to every area of the body – affecting genes, chemical reactions and even nerves. (Oschman). Pupil vs. the Iris: There are currently a number of phototherapies used on the eyes, but we must differentiate between effects on the iris and effects via the pupil. Light information that enters the pupil reaches the retina, the optic nerve, and moves further through our cognitive processes. Many visual therapies involve either looking at projected colors, the wearing of colored glasses, or looking at openings in devices which produce pulsed and colored lights. These systems affect physiological processes, and also lend themselves to psychological approaches. Ocular stimulation with light has also been used to improve the visual process itself. The book Light Years Ahead, edited by Brian Breiling, (1996). demonstrates approaches by Jacob Liberman, and Steven Vazquez about the neurophysiological effects of light therapy. In the same book Norm Shealy, M.D., discusses the effects of ocular stimulation on neurochemical release and concludes that “Light, the amount of light, the quality of light, the color of light, or the frequency of light, influences everything in your brain and, consequently, everything underneath that.” (p186). When the iris is treated, we are looking for responses other than those related to the stimulation of the retina. Color: Colors are not equal. We often think of kinds of green, or values or shades. In most light therapy applications a green is just green, and a violet is just violet. But if we spectrally analyze two violets that appear similar, we will find that their spectral fingerprints may be quite different – although they appear similar to the eye. The Photon Stimulator comes with a unique set of 12 color gel slides (many others available). These particular colors were researched by Dinshah Ghadiali in the early 1900’s and proven to be effective therapeutically on biological systems. Each element such as oxygen or hydrogen has a dominant spectral wave (color), and a corresponding action on the body. By applying the spectral waves of elements directly to the body, therapeutic results are achieved. Our bodies evolved while being surrounded by and made up of specific elements which are dominant on this planet. The spectral fingerprints of the Dinshah colors are similar to the Fraunhofer emission lines of the elements. Our cells recognize these spectral fingerprints although our cognitive visual processes do not. These are broadband filters and not monochromatic because the emissions of ionized elements are in fact broadband fingerprints. Evolution should have the greatest consideration when contemplating changes on a cellular level. How Light Enters The Body: Light can enter and affect surface tissue, but it only enters the body at the pupil of the eye, and the acupuncture meridians. The iris is also unique in that it allows light to enter through the window of the cornea, and affect tissue that would not otherwise be exposed. The Institute for Clinical and Experimental Medicine in Novosibirisk, Russia conducted some research on the effects of light on the body in the late 1970’s. Led by Dr. Pankratov, they found that light was actually showing on the body at locations different than where they illuminated the surface. They extended the research to a two year period, and found coincidentally that the light entered and exited the body only at the traditional Chinese acupuncture points. This quality of meridians was compared to optic fiber (Raum and Zeit, 1991). A new Approach to Color: There are presently a very large number of paradigms for choosing colors to be used on the body. The older ones stem from Tibetan or East Indian texts; others are channeled, and others are based on Chinese five element theory. Muscle testing is currently a very popular method of choosing which color is needed to improve a condition. While all of these may demonstrate validity as well as contradiction, I have noticed one overriding principle. Evolution has dictated our sensory abilities in response to our environment. There was always only one dominant color, and that was and still is blue to violet = the sky. The earth itself varied between shades of green and brown. The use of color in our world is a more recent event – with the commercial development of brightly colored paints and dyes and marketing strategies based on stimulation and “getting your attention” such as Braniff Airlines in the 1960’s. Buildings were all shades of brown or gray, and most clothes were quite neutral. We evolved with blue skies – affecting the top half of the spherical eye, and relatively neutral shades of browns and greens affecting the center and lower portion of the eye. Very bright colors, or reds, yellows and oranges only existed in extremely small amounts – as fruit or flowers. The source of radiation of the main life-giving rays come from the sky (blue). These solar rays influence our contact surfaces – our skin and eyes. These are the places where we interface with the universe. This may be why Tiller and Zheng found the Blue to UV range to affect so many biochemical reactions, and also why QiGong masters emit blue to UV when they heal others. Also, it would account for the strong oxidative and stimulating reactions from the reds and yellows. It is my experience that the blue to violet range of colors can be used quite safely to reinforce and balance all of the human anatomy and psychology, principally due to the interaction of these colors with the Parasympathetic Nervous System. The Parasympathetic Nervous System: The ANS influences secretion, smooth muscle response, blood vessel response, electrocardiogram, respiration and so many of our physiological functions that it cannot be excluded from this discussion of light. Eighty percent of Americans tested with Heart Rate Variability Monitors demonstrated a sympathetic overload, or hypersympathetic response. This is incredibly significant because the body is robbed of its ability to heal itself when we are in the “special program” of the Sympathetic. If we go to sleep in sympathetic our body does not heal, does not recoat our mucous membranes, our tissue does not alkalinize, our liver enzymes do not replenish as they should because the energy is not being provided through the vagus nerve. Attempts to help our clients heal without addressing the ANS are often futile, and lead us down dead end roads. The ANS is in fact a signal carrier, with antennae throughout the acupuncture meridian system and the surface of our skin. When we become fearful or excited the skin openings to the acupuncture meridians opens wider to about 5mm. Nogier’s Vascular Autonomic Signal is a result of changes in the smooth muscle which sheathes arteries and intestines and is enervated by the ANS originating in the hypothalamus. The ANS responds to our biological evolutionary genetic input, our social conditioning, and acquired beliefs and values. Our present culture dictates a greater amount of things to worry about and be fearful of. That is why most of us exist in sympathetic. Additionally, we are pushed into the sympathetic by electronic device signals such as this computer I am working on with its 67 Hz pulsing. The ANS also causes blockages along the meridian pathways, from unexpected shocks that have occurred throughout our life. Unless these blockages are addressed and removed, it is difficult to achieve total health. Tapping therapies, originally discovered by Dr.Callahan are one of the effective tools that can address ANS meridian blockages without addressing the issues psychologically. When we experience sudden and unexpected shocks, our brain initiates a secondary special program which is visible on a CAT scan as a series of circles. While our conflict is active, we remain in sympathetic. When the conflict is resolved we go into parasympathetic, but with a completely different set of symptoms. For more information about this refer to Dr. Hamer, from the University of Tubingen, Germany – web search “New Medicine”. Balance vs. Treatment: One of the most dramatic and consistent uses of light and color is that it is able to push one into parasympathetic. I have repeatedly and consistently been able to move volunteer test subjects into balanced parasympathetic parameters within five minutes by shining blue-violet colors on the pupillary border using the Photon Stimulator. I am continually surprised that within 24 hours of this one simple balancing act, that many people report dramatic changes in a complete array of physical and emotional ailments. Because of this, I am a firm believer that we have become our armor. Our social, educational, religious, and economic values collectively push us into states of constant fear – causing a large percentage of our ailments. There are three places on that body that are enervated with parasympathetic embryological tissue: the concha of the ear, the navel, and the inner pupilary border. We have found by using Heartrate Variability Monitors that we can influence the parameters of one who is in sympathetic to parasympathetic within five minutes, after 30 seconds of the application of blue to violet colors with the Photon Stimulator. We have also tested our light system by using a Kirlian photography feedback device which takes readings from the fingertips and translates that information into a computerized readout of the 14 meridians. We used the Photon Stimulator, and achieved complete balancing results when the subjects were re-tested within five minutes. Summary: Using pulsed and colored light on the iris for therapeutic effects is certainly an exciting consideration. It is painless, easy to accomplish, and results are experienced relatively fast. Although a number of researchers have been hopeful that specific organs or areas could be addressed via the reflex areas in the iris, the evidence thus far seems to indicate that most responses are mediated via a balancing of the Autonomic Nervous System. However, that finding is significant. In a hyper-sympathetic state one cannot experience joy. Joy is a function of the enervation of the solar plexus and the Vagus nerve. The Photon Stimulator offers a simple and affordable approach for individuals and researchers looking to explore a new and exciting modality.